Listed insurers in the United Arab Emirates (UAE) made a comeback in the first half of 2016, reporting aggregate profits both on an underwriting basis and a net income basis, after reporting aggregate losses in 2015. This is against a backdrop of sizable economic pressures in the Gulf Cooperation Countries (GCC), with global oil prices hovering between $30 and $60 per barrel, leading to fiscal pressures, slower economic growth, and volatile stock markets. The UAE is vulnerable to many of these factors, resulting in our reduced forecasts for GDP growth in the coming years. However, this slowdown has not been a barrier to the expansion of the local insurance market, as it continues on its growth trend with support from the Dubai Compulsory Health Insurance Scheme. Following in the footsteps of Abu Dhabi, which introduced mandatory health insurance for all residents several years ago, Dubai completed its own three-stage roll-out of health cover in June 2016. In aggregate, the UAE health insurance sector has seen a major boom since 2013, with medical premium growth averaging 30% over this period. However, considering that more than 90% of medical premiums in UAE are generated within the emirates of Abu Dhabi and Dubai combined, and both emirates have now completed their medical insurance projects, we believe it will become increasingly difficult for insurers to continue this pace of premium growth, unless they find innovative ideas to diversify into newer business lines. There are currently 60 insurance companies in the UAE, out of which 29 are listed on one of the two stock exchanges (ADX and DFM). Listed insurers control almost half of the total UAE market premiums. Listed insurers in the UAE experienced strong premium growth in the first six months of 2016. The overall market has returned to profit, both on an underwriting basis and a net income basis, after posting losses in the 2015. While growth in technical reserves is keeping pace with the premium growth, there is a potential weakening of insurers’ capital adequacy. Continuous regulatory developments keep insurers on their toes and inculcate discipline, but continue to bring uncertainty. 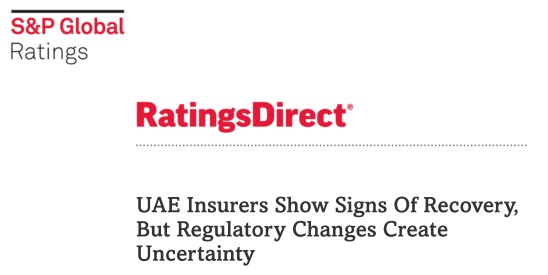 Despite the challenging operating environment, our ratings outlook on seven out of eight UAE listed insurers remains stable, reflecting their strong capital adequacy.